Today wire strung harps are made from any available and suitable wood as can be seen in the complementary article on American woods, for example. However, for those attempting to make historically accurate reproductions or just curious about the surviving old instruments some notes on those native European trees known or said to have been used in the old surviving instruments follows. Then as now the evidence suggests that the harp makers did not feel constrained by tradition and as newly introduced species of wood became available if suitable for harp making then they would happily use it. The whole subject of what woods were available and when still lacks definitive answers, as does the question of to what extent the various parts of the British Isles were woodland and how much that tree cover fluctuated with time. In the case of Ireland we are fortunate to have a record of 28 trees and shrubs listed in an 8th century legal tract which divides them into four classes. The original 28 Gaelic names have been identified with their modern counterparts and it seems safe to assume that all the older native trees were listed, (Kelly;1976). This list however does not tell us much about the quantity and distribution of the native Irish woodlands and this is known to have varied considerably over the centuries, (McCraken; 1947, 1959). 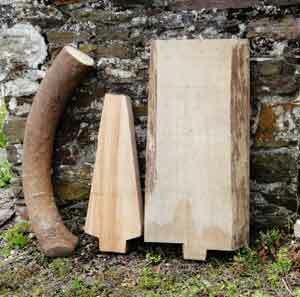 Of course using the same species of tree is just a start when considering the problems of recreating an old instrument. Wood is a very variable material as anyone who has worked with wood knows. No two trees are exactly the same even now and certainly not when comparing trees grown some centuries apart in what would have been somewhat different climates. The climate determines the growing season which in turn through the closeness of the growth rings then affects the density and behaviour of the wood. For example two trees of the same West Highland native species and age growing today within only a hundred yards or so of each other can be markedly different in size, shape and growth depending upon whether one is exposed to the full force of the Atlantic winds and carried sea spray or the other is sheltered in a south facing glen. Alternatively, trees grown in a competitive environment like a woodland will concentrate more on growing upwards, not outwards, therefore having less side branches resulting in fewer knots in the trunk and so far more suitable for harp sound boxes. Even if it was possible to find a tree of the same species growing in exactly the same spot as one used to make one of the early historic harps they would be different. One tree would have been subject to the fifteenth century climate as apposed to the twentieth century one along with the effects on growth of the latter by exposure to post industrial revolution pollutants, (some of which may actually encourage growth). Different climate also means different wind patterns and violent winds can cause internal tears or stress fractures within the tree, not always immediately visible. Then there can be further differences incurred through the way the timber was handled. Felling shakes, tears caused through the shock of the tree hitting the ground and drying checks from the stresses induced as the wood dries and shrinks which if not done evenly also can cause internal splits not always apparent until long after the wood has been worked. So although these notes have been compiled to provide some understanding of the nature of the woods used in the old harps they also demonstrate the physical limitations if not impossibility of trying to achieve an exact copy of a historic harp.